Sometimes, I have moments where I feel like a badass because I regularly drive some pretty old cars. But like every moment where I feel like a badass, it’s very short-lived, because I remember that people like Jim Eby exist. 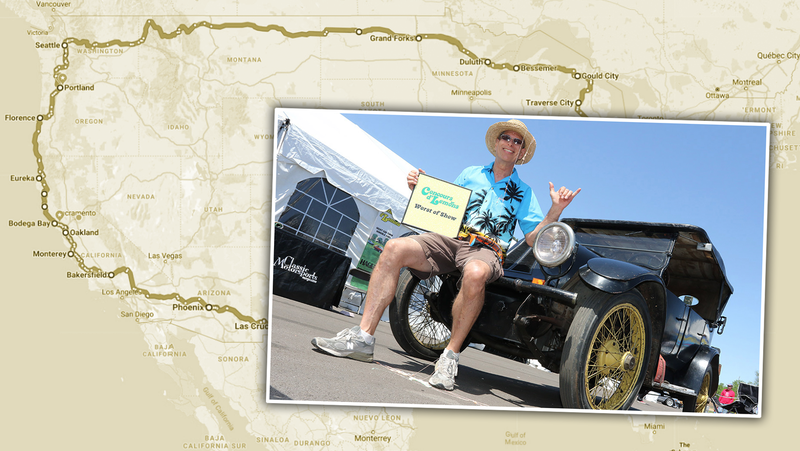 He’s about to drive a 99-year-old air-cooled Franklin on a massive trip all over the country. The goal of the trip is to go to every Concours d’Lemons event in the continental U.S., which seems to have been inspired by Eby’s winning of the highly desired “Worst in Show” award at the Georgia Concours d’Lemons. Eby is planning to attempt to drive in a large circuit around the perimeter of 3/4 of America, crossing through at least 17 or 18 states. Concours d’Lemons organizers have made it clear that the most they can give him is a “Road Hammer” trophy they just made up for him, but that seems to suit Eby just fine. Keep in mind that the Franklin’s top speed is only about 45 MPH, and, because the engine lacks any provision to oil the top end, he’ll have to stop about every 100 miles to pop the head off the inline-six and oil it by hand. A similar Franklin. That’s probably not the guy’s grandfather. Franklins were very interesting cars. They were the only American make that was exclusively air-cooled, and built cars between 1906 and 1934. The 1919 Franklin Eby is driving is a Series 9b Touring car, and features a rakish, Renault-like sloping nose and, I think, some handsome lines. The 25 horsepower car has been in Eby’s family since his grandfather bought the car, and it’s been used for cross-country trips as early as 1929, and again in 1947. So the car is certainly not some novice at this sort of thing. The 24 Hours of Lemons site has the proposed schedule for the Franklin’s journey, and requests that anyone along the route consider being open to letting Jim use their driveways or garages for repairs, or just to give this glorious loon and his near-century-old car some support. So, if you’re so inclined and can make yourself available, I’m sure it’d be appreciated!